Definition at line 44 of file interest.hpp. Construct an Interest with given name and lifetime. 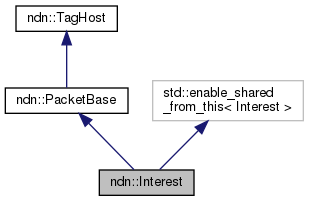 In certain contexts that use Interest::shared_from_this(), Interest must be created using make_shared. Otherwise, shared_from_this() will trigger undefined behavior. Definition at line 46 of file interest.cpp. Construct an Interest by decoding from wire. Definition at line 60 of file interest.cpp. Prepend wire encoding to encoder. Definition at line 70 of file interest.cpp. Referenced by ndn::Face::Impl::asyncExpressInterest(), ndn::Face::Impl::asyncPutNack(), ns3::ndn::L3RateTracer::InNack(), ndn::operator==(), ns3::ndn::L3RateTracer::OutNack(), and ndn::util::DummyClientFace::receive(). Encodes into NDN Packet Format v0.3 if Parameters element is present. In this case, Selectors are not encoded. Otherwise, encodes into NDN Packet Format v0.2. Definition at line 202 of file interest.cpp. Definition at line 218 of file interest.cpp. References getNonce(), hasNonce(), ndn::tlv::Interest, ndn::Block::parse(), setNonce(), ndn::to_string(), and ndn::Block::type(). Definition at line 90 of file interest.hpp. Referenced by ns3::ndn::L3RateTracer::InNack(), and ns3::ndn::L3RateTracer::OutNack(). Return a URI-like string that represents the Interest. The string starts with getName().toUri(). If the Interest contains selectors, they are included as a query string. Example: "/test/name?ndn.MustBeFresh=1"
Definition at line 408 of file interest.cpp. Check if Interest, including selectors, matches the given name. Definition at line 418 of file interest.cpp. References ndn::Exclude::empty(), getExclude(), getMaxSuffixComponents(), getMinSuffixComponents(), ndn::Exclude::isExcluded(), ndn::Name::isPrefixOf(), and ndn::Name::size(). Check if Interest can be satisfied by data. This method considers Name, MinSuffixComponents, MaxSuffixComponents, PublisherPublicKeyLocator, and Exclude. This method does not consider ChildSelector and MustBeFresh. Definition at line 445 of file interest.cpp. References ndn::Block::elements_end(), ndn::KeyLocator::empty(), ndn::Exclude::empty(), ndn::Block::find(), ndn::Name::get(), getExclude(), ndn::Data::getFullName(), ndn::Signature::getInfo(), getMaxSuffixComponents(), getMinSuffixComponents(), ndn::Data::getName(), getPublisherPublicKeyLocator(), ndn::Data::getSignature(), ndn::Exclude::isExcluded(), ndn::name::Component::isImplicitSha256Digest(), ndn::Name::isPrefixOf(), ndn::tlv::KeyLocator, ndn::Name::size(), and ndn::KeyLocator::wireEncode(). Referenced by nfd::cs::Entry::canSatisfy(), ndn::security::v2::CertificateCache::find(), ndn::security::v2::TrustAnchorContainer::find(), and ndn::InMemoryStorage::selectChild(). Check if Interest matches other interest. Interest matches other if both have the same name, selectors, and link. Other fields (e.g., Nonce) may be different. Implement distinguishing Interests by forwarding hint. The current implementation checks only name+selectors (Issue #3162). Definition at line 529 of file interest.cpp. Definition at line 134 of file interest.hpp. Referenced by nfd::fw::SelfLearningStrategy::afterReceiveNack(), ndn::Face::Impl::asyncExpressInterest(), ndn::Face::Impl::asyncPutNack(), nfd::pit::Entry::canMatch(), ndn::security::v2::ValidationPolicySimpleHierarchy::checkPolicy(), ndn::security::v2::validator_config::ValidationPolicyConfig::checkPolicy(), nfd::ManagerBase::extractRequester(), nfd::cs::Cs::find(), ndn::security::v2::CertificateCache::find(), ndn::security::v2::TrustAnchorContainer::find(), ndn::InMemoryStorage::find(), ndn::security::v2::getKeyLocatorName(), nfd::fw::asf::AsfMeasurements::getOrCreateNamespaceInfo(), nfd::CommandAuthenticator::makeAuthorization(), matchesInterest(), nfd::fw::Strategy::onDroppedInterest(), ns3::ndn::Consumer::OnNack(), ndn::operator<<(), ndn::security::parse(), ndn::InMemoryStorage::selectChild(), ndn::mgmt::StatusDatasetContext::setPrefix(), ndn::security::v2::KeyChain::sign(), ndn::mgmt::StatusDatasetContext::StatusDatasetContext(), ndn::security::v2::Validator::validate(), and nfd::fw::wouldViolateScope(). Definition at line 140 of file interest.hpp. Declare the default CanBePrefix setting of the application. As part of transitioning to NDN Packet Format v0.3, the default setting for CanBePrefix will be changed from "true" to "false". Application developers are advised to review all Interests expressed by their application and decide what CanBePrefix setting is appropriate for each Interest, to avoid breaking changes when the transition occurs. Application may either set CanBePrefix on a per-Interest basis, or declare a default CanBePrefix setting for all Interests expressed by the application using this function. If an application neither declares a default nor sets CanBePrefix on every Interest, Interest::wireEncode will print a one-time warning message. This function should not be used in libraries or in ndn-cxx unit tests. Definition at line 162 of file interest.hpp. Check whether the CanBePrefix element is present. This is a getter for the CanBePrefix element as defined in NDN Packet Format v0.3. In this implementation, it is mapped to the closest v0.2 semantics: MaxSuffixComponents=1 means CanBePrefix is absent. Definition at line 174 of file interest.hpp. Add or remove CanBePrefix element. canBePrefix whether CanBePrefix element should be present. This is a setter for the CanBePrefix element as defined in NDN Packet Format v0.3. In this implementation, it is mapped to the closest v0.2 semantics: MaxSuffixComponents=1 means CanBePrefix is absent. Definition at line 187 of file interest.hpp. Referenced by Interest(), and ndn::security::CommandInterestSigner::makeCommandInterest(). Check whether the MustBeFresh element is present. This is a getter for the MustBeFresh element as defined in NDN Packet Format v0.3. In this implementation, it is mapped to the closest v0.2 semantics and appears as MustBeFresh element under Selectors. Definition at line 202 of file interest.hpp. Referenced by nfd::cs::Entry::canSatisfy(), ndn::operator<<(), and ndn::InMemoryStorage::selectChild(). Add or remove MustBeFresh element. mustBeFresh whether MustBeFresh element should be present. This is a setter for the MustBeFresh element as defined in NDN Packet Format v0.3. In this implementation, it is mapped to the closest v0.2 semantics and appears as MustBeFresh element under Selectors. Definition at line 215 of file interest.hpp. Definition at line 223 of file interest.hpp. Definition at line 581 of file interest.cpp. Definition at line 243 of file interest.hpp. Check if the Nonce element is present. Definition at line 253 of file interest.hpp. Referenced by ndn::operator<<(), refreshNonce(), and wireDecode(). If nonce was not present, it is added and assigned a random value. Definition at line 539 of file interest.cpp. Referenced by ndn::operator<<(), refreshNonce(), nfd::pit::OutRecord::setIncomingNack(), nfd::pit::FaceRecord::update(), and wireDecode(). Definition at line 548 of file interest.cpp. Referenced by refreshNonce(), and wireDecode(). If the Nonce element is present, the new nonce value will differ from the old value. If the Nonce element is not present, this method does nothing. Definition at line 556 of file interest.cpp. References ndn::random::generateWord32(), getNonce(), hasNonce(), and setNonce(). Definition at line 279 of file interest.hpp. Referenced by ndn::operator<<(), and nfd::pit::FaceRecord::update(). Definition at line 570 of file interest.cpp. Definition at line 291 of file interest.hpp. Definition at line 297 of file interest.hpp. Set parameters from a Block. If the block's TLV-TYPE is Parameters, it will be used directly as this Interest's Parameters element. If the block's TLV-TYPE is not Parameters, it will be nested into a Parameters element. Definition at line 589 of file interest.cpp. References ndn::tlv::Parameters, ndn::Block::reset(), and ndn::Block::type(). Copy parameters from raw buffer. Definition at line 602 of file interest.cpp. References ndn::encoding::makeBinaryBlock(), ndn::tlv::Parameters, and ndn::Block::reset(). Set parameters from a wire buffer. Definition at line 610 of file interest.cpp. Remove the Parameters element from this Interest. Definition at line 618 of file interest.cpp. Check if Interest has any selector present. Definition at line 340 of file interest.hpp. Definition at line 347 of file interest.hpp. Referenced by nfd::pit::Entry::canMatch(), and matchesInterest(). Definition at line 354 of file interest.hpp. Definition at line 363 of file interest.hpp. Referenced by matchesData(), matchesName(), and ndn::operator<<(). Definition at line 370 of file interest.hpp. Definition at line 379 of file interest.hpp. Definition at line 386 of file interest.hpp. Definition at line 395 of file interest.hpp. Definition at line 402 of file interest.hpp. Definition at line 411 of file interest.hpp. Definition at line 418 of file interest.hpp. Definition at line 427 of file interest.hpp. Referenced by nfd::cs::Cs::find(), ndn::operator<<(), and ndn::InMemoryStorage::selectChild(). Definition at line 434 of file interest.hpp. Definition at line 628 of file interest.cpp.